BeautyH2T: Introducing; The Protein Drinks Co. Introducing; The Protein Drinks Co. Protein drinks and powders are an area I have very much shied away from when it comes to my interest in health and fitness. So far I have preferred to ensure my body is getting everything it needs from paying close attention to my diet but I am aware that using various protein supplements are all around me. I can't move in my gym without bumping into someone mixing there latest shake, or flick through my instagram feed without seeing some delicious recipes using some pretty tasty sounding powders like cookies and cream and peanut butter choc. I was definitely growing more intrigued so when the chance to sample a couple of The Protein Drinks Co's products came along my curiosity got the better of me. 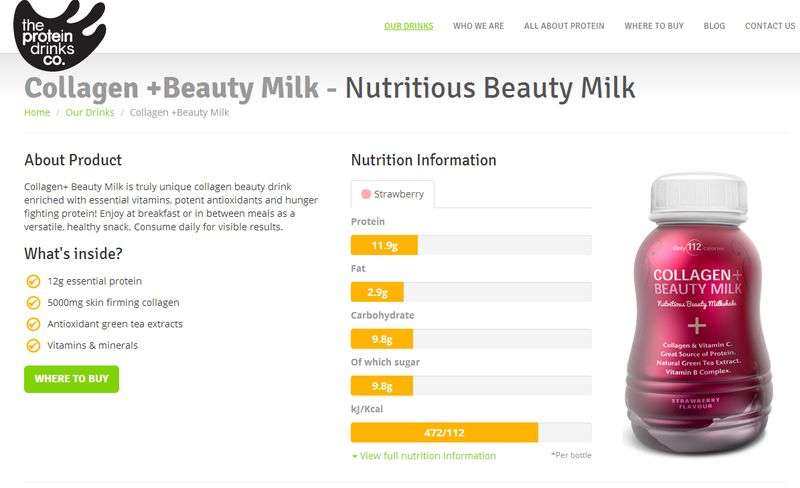 Ranging from breakfast to go style shakes to a collagen enhancing drink the company certainly impressed me from the outset with their clear and easy to use website, to the offers on a few of their products at Tesco. All the drinks are designed to increase protein intake as it gives a whole host of benefits from building and maintaining your organs and muscles, to providing a vital energy source and making up important elements of you hair and nails. I love how the nutritional breakdown of each drink is clearly visible on the site, I think it is so important to know what you are ingesting and I also think they are priced really reasonably which is another side of the protein world I have been put off by. Each of the flavours I have tried have been absolutely delicious and have definitely left me feeling satiated for a long while. The addition of collagen in the Beauty Milk option is a cool concept I am not aware of seeing elsewhere and if i can fit a good amount of protein in while helping my skin at the same time, I am more than happy! I have definitely found eating healthy on the go can be quite difficult and this is where I can see how these drinks could help me out. Being nice and filling ( although I wouldn't be seeing them as purely meal replacements drinks as I still believe the daily diet is incredibly important) I am happy to have something I can pick up and give me a big protein hit to keep going without having to just reach for the bad options. Similarly the breakfast drink is another really handy pick up for early mornings on the move, I usually have porridge so the addition of the liquid oats to the protein is ideal for me. I have really enjoyed giving these a go and will be picking up a few more to keep in the cupboard to have on standby. Does anyone else use drinks like these?